Facebook is now projecting “the best place for bands to reach fans and promote themselves” image, as the social network relaunches the Music on Facebook Page. 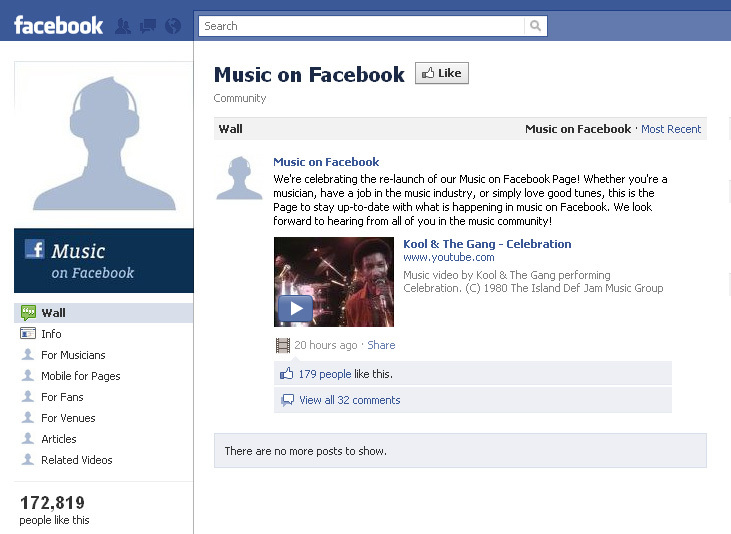 This is the new page’s first status message welcoming visitors when they search for “Music on Facebook”. Click “Like” and the page instantly becomes a tool for musicians and fans alike to reach each other. Launched in 2008, Music on Facebook was seen as a means to get bands started on the social network. However, the page lost popularity over time as updates lagged. But as the music industry’s demand to Facebook to get the most out of the social network swelled, the Page was relaunched. The brand new Music on Facebook Page is geared towards helping musicians and other members of the music industry to best leverage the social network’s features, as well as promoting newbies in the music scene. In an interview with Mashable, Facebook rep Meredith Chin said, “Music has always been a part of Facebook,” as she referred to the number of users who identify themselves by their musical tastes. “Now musicians are tapping into that; they’re going where the people are. We want to get better and better at helping people in the music industry connect with each other and their fans in a meaningful way,” she added.